Let’s face it everyone loves to have the opportunity to get hold of a piece of mobile tech gear for free, and many places run contests, giveaways and lotteries offering chances to win free gratis tech gear, and we have one such giveaway for you today that is offering the opportunity to win a Samsung Galaxy Note 2. The Samsung Galaxy Note 2 is expected to make its debut during IFA 2012 in Berlin in a few days time, and as such the guys over at Android Authority are running a giveaway whereby you could end up owning the Samsung Galaxy Note 2, and for once it appears that this giveaway isn’t just for those in the good old US of A. As always there are some conditions to entry a giveaway, so if any of our readers wish to give the Samsung Galaxy Note 2 International giveaway, here’s what you will need to do, you will need to give Android Authority some ‘social love’ meaning you can subscribe to their YouTube Channel, circle them on G+, like them on Facebook, subscribe to them on Google Currents, follow their Twitter, listen to Android Authority On Air, and like, plus one, or tweet their giveaway article. 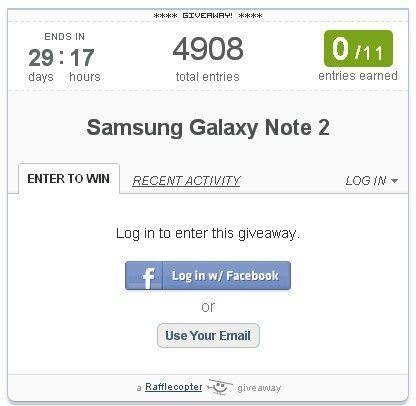 For doing the above your get, two entry tickets for the YouTube subscription, two tickets for circling on G+, and one entry ticket for each of the rest, meaning you can snag yourself up to eleven entry tickets for the Samsung galaxy Note 2 International giveaway. The Galaxy Note 2 giveaway runs all the way up until the 23rd of September, after which the guys will of course select that lucky winner, and as the saying goes, you have got to be in it to win it, so why not give it a go. how am i supposed to check in,,,,?? ?